With the United States and North Korea continuing to clash over declaring an official end to the Korean War, concerns are mounting that what was thought to be an easy idea is now emerging as a major obstacle to denuclearization talks. Pyongyang has upped the pressure on the US to adopt a declaration for ending the Korean War and move toward replacing the current armistice with a peace treaty. Washington, meanwhile, argues that significant progress on North Korea‘s denuclearization must come first. The persistent tug-of-war has left South Korea with the task of meeting Pyongyang and Washington’s interests halfway, Seoul-based experts said, noting that the Moon Jae-in administration should be flexible on the declaration’s signatories and binding force. “We don’t have to stick to the idea of signing an agreement or adopting an accord. It can be a simple declaration like ‘There will be no more war on the Korean Peninsula,’” said Cho Seong-ryoul, a senior researcher at the Institute for National Security Strategy. “It doesn’t have to be an agreement among leaders. Foreign ministers from three or four countries can gather to adopt such a declaration,” said Cho, who was involved with the Roh Moo-hyun administration’s similar attempt at declaring an end to the Korean War. Compared to the previous inter-Korean summit agreements, the latest Panmunjom Declaration between President Moon and North Korea’s leader Kim Jong-un leaves flexibility on who can declare an end to the Korean War and where they can meet to discuss the measure. According to the 2007 inter-Korean summit agreement, “leaders” from three or four countries relevant to the armistice agreement should meet “on the Korean Peninsula” to declare an end to the Korean War. However, there were no such restrictions in the Panmunjom Declaration adopted after the inter-Korean summit in April. The document only states that the two Koreas will declare an end to the Korean War by the end of this year. “If we decide to pursue declaring an end to the Korean War among foreign ministers, it can take place at any time and at any place. ... If we consider summit meetings, we have two opportunities. One is at the UN general assembly in September and the other is at East Asia Summit in November,” Cho said. The tug-of-war between North Korea and the US continues to escalate. With North Korea accusing the US of making little progress on the end-of-the-war declaration, concern is growing in Washington over what lies behind Pyongyang’s moves. North Korea’s Rodong Sinmun reiterated Thursday the end-of-the-war declaration could be helpful in building mutual trust for denuclearization talks. The state newspaper added that it is a part of the process of implementing the US-North Korea summit agreement reached in June. But Washington has stressed that the idea of ending the Korean War is still premature without significant progress on denuclearization. The US also cautioned against any rush by South Korea in pursuing the idea. “One of the things that hasn‘t happened is the demonstrable moves toward denuclearization before we can entertain something like the end-of-war declaration,” US Ambassador to South Korea Harry Harris told reporters last week. 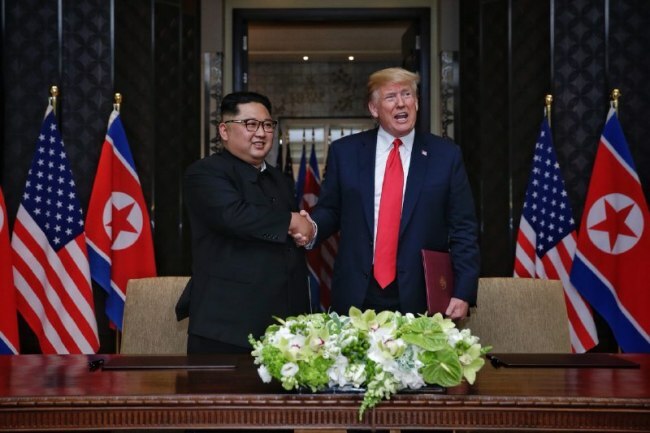 US President Donald Trump had appeared to believe that end-of-the-war declaration was not much of a concession for disarming North Korea of its nuclear program. In June, Trump said adopting such an agreement can be an “easy part” of the difficult process of denuclearization talks. However, a voice of caution has emerged in Washington after US Secretary of State Mike Pompeo’s July visit to Pyongyang fell short of meeting US expectations. Pompeo returned home without meeting with North Korean leader Kim. What worries US policymakers and experts most, experts said, is that declaring an end to the Korean War would leave the US with little room for pursuing military measures against North Korea -- if denuclearization talks were to collapse. “Once the US agreed to the end-of-the-war declaration, it would lose key leverage against North Korea. It will become extremely unlikely for the US to pursue a military option after declaring an end to the war,” said Kim Jae-chun, a professor at Sogang University Graduate School of International Studies.